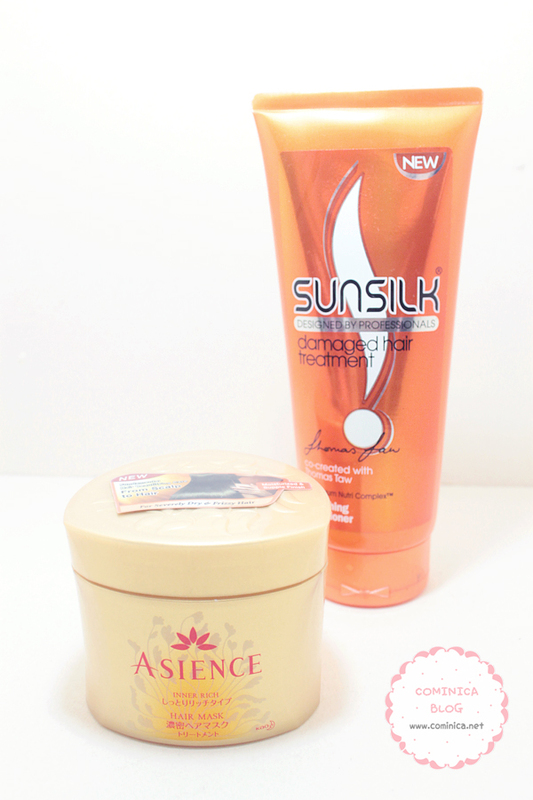 '♔ Cominica Blog ♔: My Hair Care Routine! I usually find my hair treatment at big supermarket near from my house like Hypermart or Carefour. Because it's easier to find and restock, ( ˚̯́ ﹏˚̯̀). I'm quite lazy when it comes to online shopping, especially when it's related to my hair because I use it regularly. Other than my skin, I care about my hair too ヾ(☆▽☆). A hair is part of identity right? So, here's my hair care products that I use at the moment.
. I usually use this hair spray before curling my hair. 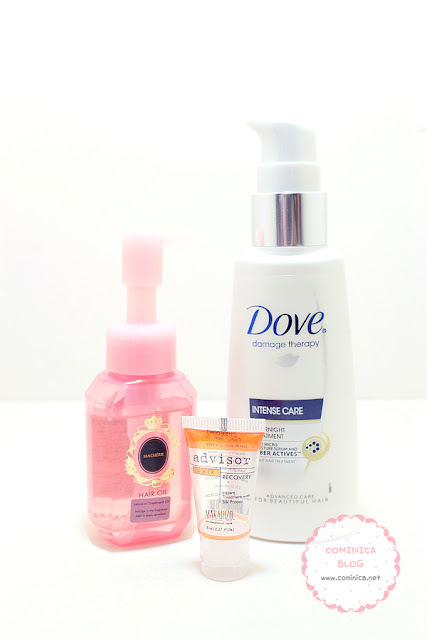 It can moisture my hair before curling and reduce dryness after curling. Can check my review "here". I use this hair spray before and after dry my hair. Formulated with Raspberry extract and gives moisture to hair. I usually use this whenever I feel my hair look messy and frizzy. I love the sweet and refreshing scent! This is a light-weight texture hair essence oil that provides deep penetration and nourishment to hair. I usually use it after dry my hair with hair dryer, because it's light-weight my hair isn't feel greasy, oily or sticky! It makes my hair look shiny and smooth too! My hair sometimes can look a little messy after hair drying and this essence really help me a lot♡ . An intensive hair mask for damaged and dry hair like me. I LOVE THIS HAIR MASK, hahha. This is my second purchase, it's not available in Indonesia though. I bought this product in Singapore. Beside that, this product is easy to find here, whahahaha. That's all the products I use for my hair, it's not a lot right? I still want to find other hair care products for my hair. 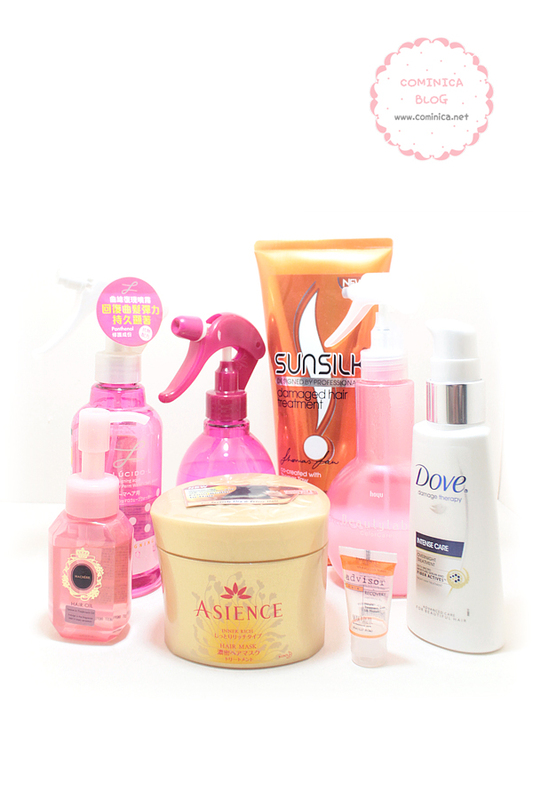 I really want to try other product from Liese and Asience next time, probably conditioner, hair mask or hair essence. I have the Liese Juicy Shower, but I'm not sure it has done anything for me.. The smell kind of smells like American cough syrup ;___; I love the Ma Cherie oil though! Smells and works amazing, a lighter oil than others I have tried! I don't do any treatment to mine ;^; but I probably should >> The hair mask sounds interesting! how much is the shiseido ma cherie? is it available in local indonesian counter? I didn't even know they made night treatment hair products like that one you mentioned :o How neat! I need to get around to making a post like this as well. ka comi, emang katanya kalo sering keramas, rambut malah jadi susah panjang ya? trus kalo colored hair emang bagusan pake shampoo khusus warna atau shampoo buat damaged dry hair bisa juga?